Since 1994, Turgeon Engineering has been assisting companies such as Lucent, Elmos, Legerity, Tyco, and Raytheon with their custom analog and mixed-signal designs. We offer a complete design service from concept to product delivery. By guiding our customers towards manufacturable ICs at the onset of the design, we have successfully saved them time and money by shortening the development to production transition. On this site, details of our what we offer are provided under SERVICES. There, you can find all our capabilities, from design and modeling to testing and support, that will be used to fulfill your project needs. The DOWNLOAD section contains technical information that we share with you on device modeling, circuit design, and CAD tools. The technical notes are one to two pages, addressing topics of interest to our subscribers. More details on the topics can be found in the papers and tutorials sections. These documents are in Adobe PDF format, and are accessible to anyone who registers on our web site. The presentations are PDF slide presentation that we have given such as custom ICs in small volume, rad hard ICs and high temperature ICs. 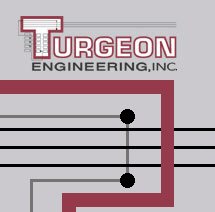 Learn more about Turgeon Engineering in the ABOUT US section. Here, you will find a history of the company and its employees, as well as testimonials from satisfied customers who used our services to save them time and money. Finally, feel free to contact us if you have any questions or to register for the free materials available on the site. Turgeon Engineering Inc. is a 100% veteran owned small business.